A conversation with Reverend Liz Theoharis on the campaign’s broad agenda for 2019. On New Year’s Eve, Reverend Drs. 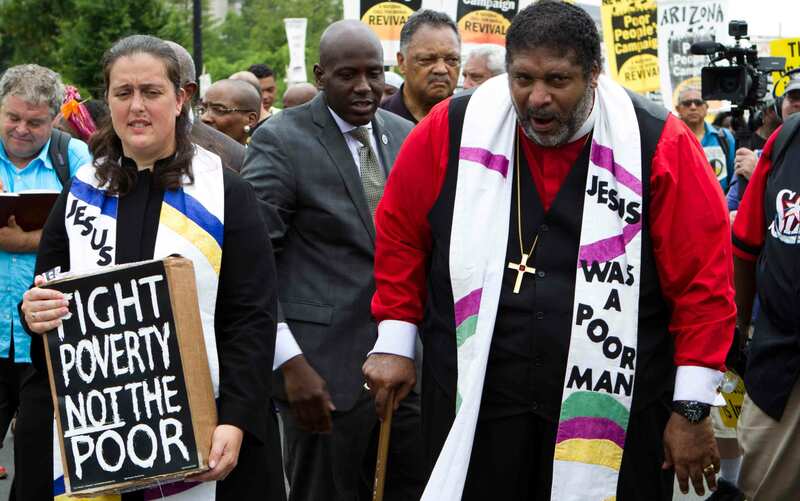 Liz Theoharis and William Barber II, co-chairs of the Poor People’s Campaign: A National Call for Moral Revival, laid out the campaign’s plans for 2019. The Poor People’s Campaign will continue its pursuit of an audacious agenda: eradicating poverty and systemic racism; addressing ecological devastation, militarism and the war economy; and changing the narrative about poverty in this country from one that demonizes the poor to one which recognizes their strengths and vision while questioning the morality of current public policy. Greg Kaufmann: On New Years Eve, in commemoration with Watch Night, you and Rev. Barber laid out the plans for the Poor People’s Campaign: A National Call for Moral Revival. What was the significance of that timing? Rev. Dr. Liz Theoharis: Watch Night [commemorates New Years Eve], 1862. Slaves, free blacks, white abolitionists and black abolitionists gathered together not knowing whether Abraham Lincoln was actually going to sign the Emancipation Proclamation, and [knowing] that even if he did, there would be a lot of people not covered. So the work to liberate those who were still enslaved would continue. The Emancipation Proclamation was an extension of what slaves had already been doing. There were 50,000 to 100,000 slaves who freed themselves on the Underground Railroad. And in moving from an enslaved state to a free one, they challenged the immorality of slavery. And so the Emancipation Proclamation is about really expanding that; it’s a law coming out of what slaves were doing for liberation. So Watch Night is about people preparing to continue to act in the face of injustice for liberation. While times and conditions are different than in 1862, we still have people needing to get together to liberate people and achieve freedom. GK: Is that how you view the work of the Poor People’s Campaign—as liberating people to achieve freedom? RLT: Yes, we have put out a set of demands that are about liberation and freedom—freedom from poverty, freedom from hunger, freedom from unemployment, freedom from homelessness, freedom from the suppression of your vote, freedom to have clean water and clean air. The very principles upon which this nation was founded are freedom and justice and that is still not achieved—especially when you have 140 million poor and low-income people, when you have fewer voting rights in this past election than we did 53 years ago. There surely have been powerful and important movements that have arisen between abolition and today, but people are not living the lives that God’s children are meant to live and we could do so much better. GK: One criticism the campaign has faced is that your agenda is too broad—that you should narrow your focus, get some victories, and build momentum that way. Why does the campaign feel the agenda needs to be as broad as it is? RLT: If you talk about someone who is struggling around living wages, that person is also likely having problems with healthcare [and] housing, [and] most likely has kids going to schools that are underfunded. You can’t just focus on living wages, or housing, because the way they play out in people’s lives—it’s all mixed together. When we were trying to identify the places where we should focus the Poor People’s Campaign, we did a mapping process. We started with the issue of voter suppression and saw—which states had enacted voter suppression laws? What states are appointing emergency managers or other kinds of attacks on democracy? We found that those same states that are suppressing votes, that are harming democracy, have the highest poverty, the highest child poverty, the lowest wages, the least protections for LGBTQ folks, the most discrimination against immigrants, the least environmental protection. So what also became clear to us is that we have to look at these issues as they are linked because those who we are up against are doing that. GK: So when you go into new communities and approach people who haven’t been politically engaged in the past—does this agenda energize them or do they feel overwhelmed by it? RLT: Our experience has been that people are very excited to have an agenda that speaks to all of these issues—for one, because that agenda comes out of actual consultation with poor people who come up with the proposals. What we have found is people who are impacted by these injustices are very empowered by the fact that they are not alone in their struggle, and that there are people willing to come together to fight. It raises the imagination that things don’t have to be this way. I remember Mashyla Buckmaster out of Grays Harbor, Washington, standing on stage [on the National Mall] on June 23 and talking about how her involvement in this work has helped to give her life meaning, but has also instilled in her peers—other millennials, others who are homeless millennials—that they can do something about it. She talked a lot about how people have been so beaten down, and so having people fighting every day to enact this agenda—that becomes empowering to people. GK: Some poor people have told me that due to stigma, the process of publicly admitting they were poor and taking political action was really difficult. In the campaign’s organizing efforts, is stigma a significant issue and, if so, how are you all overcoming it? RLT: For so long, the word “poor” became like a four-letter word in our society. For about 50 years, no one talked about poor people, and if they did it was to blame folks as lazy, crazy, and stupid. If you look at our political rhetoric today, still, it’s about the middle class, [or those] striving to be in the middle class. And yet, currently, 140 million people are poor or low-income. So for decades, to not have any real discussion or debate, or real proactive solutions coming forward to address the problems that the poor face—it’s led to people really blaming themselves for problems that they are having. What we’re seeing is that when people come together and start organizing, then so many other people come forward too. In the banding together of clergy and activists, and poor people, therein lies the solutions to the problems that people are having; not that we’re waiting for one more policy, or one more program, or one more great person to be elected—but that by building power, shifting the narrative, and by organizing, organizing, organizing—we’re going to be able to change things to make sure that people have a right to thrive, not just barely survive. GK: In terms of changing things, on Watch Night Rev. Barber said that part of that work is focusing on connecting with districts where if even 10 percent of currently non-voting poor people voted, they could swing an election. As he put it, “We’re getting ready for a new electorate to change America’s history.” How do you identify those districts and what does that engagement look like? RLT: Throughout last summer and fall and into this winter [we have been] registering people for a movement that votes. So what that looks like is going into communities in all 40 states—and going door to door, holding barbecues and meetings, holding hearings. We’ve had some help in terms of identifying where to go. The coordinating committees of these state campaigns are made up of a real diversity of people who are deeply engaged in their states and communities. Some of the identifying is also through statisticians and others who help us map out where there are high numbers of people who are living under poverty, who are qualifying for SNAP, who are experiencing wage cuts, and bring that together with an analysis of where are there communities where people have not been voting. In many cases [it’s] because the folks running, and the policies that they are proposing, don’t speak at all to the issues that are facing people. GK: Rev. Barber mentioned that he wants every state to sign up 30,000 people that they can go to for actions at any time. Is there any particular thinking behind that goal of 30,000? It’s about a critical mass. What we’ve heard from people throughout history and from policy folks today, when you get to a certain number of folks you can impact elections, impact policies, and you can build a power to not be messed with. Like this week we still have a shut-down government. We have 800,000 federal workers who aren’t receiving a paycheck, and a lot of those workers are just a paycheck—this paycheck—away from economic insecurity. The shutdown is making schools on Native American reservations close; it’s threatening SNAP and other benefits of many, many poor people across the country. And so, [we want to have] a base of people that can be activated and mobilized when these kinds of things happen. On a state level—Arkansas recently attached work requirements to Medicaid that immediately meant that basically 12,000 people were cut off of Medicaid. A lot of the power building that we are doing in these states is to develop a base of people that will be permanently organized. So if anything breaks out—to be able to respond and react [and] say, “No—not here, not us, not now.” But then also having a critical mass of people who can make our agenda, the agenda. Dr. King talked about it, saying, can we amass the power to make the power structure in this nation say yes when they really are desirous of saying no? That’s what power building is. GK: In terms of making your agenda the agenda, another way you all are trying to do that is to show what your demands would cost at the state and federal levels. Can you talk about that work? RLT: Yes, likely in March, we will unveil a budget analysis of [our] demands to show that it is possible and how we would do it. It doesn’t mean completely defunding the military, and it doesn’t mean raising taxes on everybody.… It’s really important to show that this idea that we can’t have universal health care, we can’t have a right to a job with a living wage, we can’t house everybody, we can’t actually educate everybody including through college and universities for free—that these are just lies. It’s not that we can’t do it, it’s that we don’t have the will to do it. We’re building that will through the power of the people. GK: The states are also organizing poverty bus tours with members of the media. Is that part of the effort of showing, as you put it on Watch Night, that “poor people are agents of change rather than objects of history”? RLT: The states will determine what kind of communities we should be visiting. In some cases it will be communities that have been deeply engaged in the campaign but are still these forgotten places. If you look at a state like Pennsylvania, they are organized in like seven counties across the state—with really strong campaign committees in each: in Altoona, Lancaster, Johnstown…. For example, some of the best organizing in the whole country is happening in Johnstown amongst poor white moms, who are in connection to poor Latinos and poor black moms as well. They will also make sure to show the realities of some of the issues that we’ve raised: go[ing] to some of these indigenous burial sites that are being completely attacked because of copper mining in Oak Flats, Arizona; or to visit Flint where people today, still, are without water; but then visit a number of other communities across Michigan who all have similar conditions. And it’s not just about water. The reality is just the piling up of oppression. Not only is your water poisoned, not only are emergency managers in charge and democracy is squashed, but the education system is terrible, the immigration policies are terrible, your health care is abominable. [This is] not a tour to “look at these sad poor people”—but to see that it’s these very poor people who are rising up to change society. These bus tours are also about deepening and broadening the organizing that folks are doing, and getting ready for the [Poor People’s] Congress that we are planning to hold in June 2019 in Washington, DC—spreading the word that there is this campaign, that we have these demands. 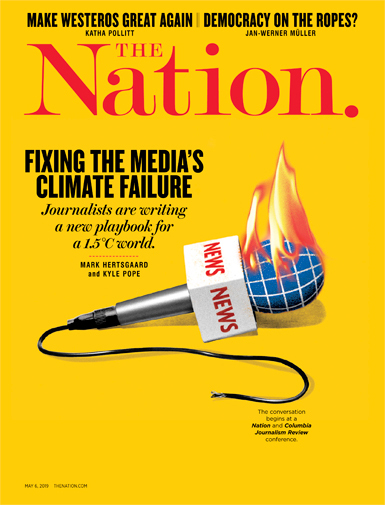 GK: Anything else you want readers to know about how the campaign is mobilizing people and communities as agents of change? RLT: If you look at how change has happened in US history—it’s slaves and freed slaves who helped lead the abolitionist movement. Similarly with women’s suffrage, the industrial union movement, the civil-rights movement—those who are most impacted by the problems we’re trying to solve have to be in the leadership, coming up with the solutions, the strategic analysis, the actions. I’m not saying that the Poor People’s Campaign is only made up of people who are currently experiencing poverty and homelessness. What’s also true is that you have to have a broad movement. And these issues do impact people of all walks of life—some materially, some morally. But I think in our day and age, often the notion that poor people can lead something flies in the face of what people think. Many people in society, whether it’s faith leaders, politicians, or leaders of NGOs, often have an aversion to the leadership and agency of the poor. This campaign is saying we need everyone—we need rich people, doctors, lawyers, business people—but we’re working with the poor, not for the poor. Because we’re serious about actually addressing these issues and to do that effectively we have to recognize the leadership of those whose kids are dying, whose moms are dying, whose houses are being burned, and who face this kind of injustice right now.